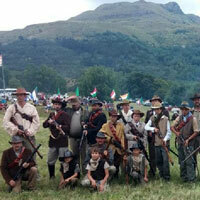 Starting from the museum at 8:30 you will go back into Dundee to visit sites associated with the battle. 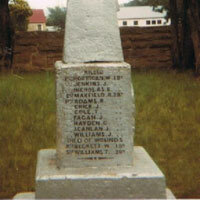 The position of the British camp, the mission station used as a British hospital, the cottage hospital, the positions of the artillery guns, St James Anglican church where Gen Sir William Penn Symons, who died of his wounds in the battle lies buried, the Anton von Wouw memorial to the Boer forces on the clock tower of the Dutch Reformed Church. You will also travel up to the top of Mpati mountain to experience the view that the Boer forces under Gen “Maroela” Erasmus had over the battlefield, and the probable position of the “Long Tom” cannon that the Boers brought down from Pretoria. 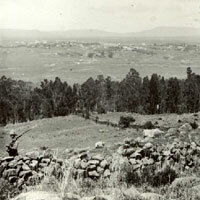 From this vantage point the route which the British troops followed on their retreat to Ladysmith 2 days after the battle will be pointed out. Return to the museum and hear further accounts of the battle as you cross the lawns and walk up the face of Talana hill, following in the footsteps of the British soldiers. 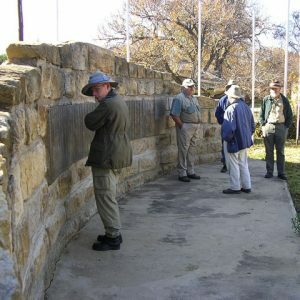 On top of the hill visit the Boer schanzes, the British fort built in August 1900 to defend Dundee against Louis Botha’s second invasion. Returning down the hill you will be able to see the museum exhibits relating to the battle as well as other exhibits in this multi faceted museum. Tour finishes at 16:30. Accompanied by experienced and knowledgeable guides from Dundee visit Talana Museum and battlefield on the outskirts of Dundee. Feel the atmosphere and experience history come alive as you follow your guide in the footsteps of the British soldiers across this blood drenched battlefield and up the walking trail on Talana hill. 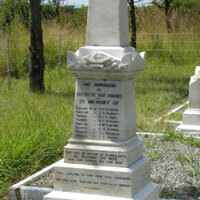 The battle of Talana was the first battle of the Anglo Boer War 1899-1902 and the battlefield, hill and British soldiers cemetery are all part of the heritage park. 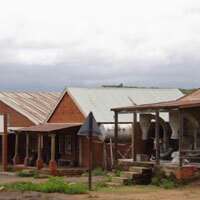 The museum set at the base of Talana hill has 27 buildings with a number of different exhibits ranging from the battle of Talana and the Anglo Boer War, Anglo Zulu war of 1879, the early San inhabitants of the area and their rock art, the national coal mining museum, a magnificent glass gallery and bead gallery. 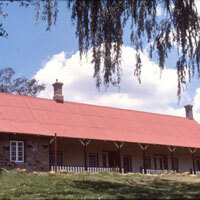 The Smith cottage is the home of one of the founders of the town, Peter Smith and the museum is on his original farm. Exhibits on the Great War 1914-1918 and the Dundee and South African involvement, the 1913 Passive Resistance Movement, agriculture, a superb clothing collection and evocative Zulu cultural village, as well as the Smith family, pioneer and military cemetery are some of the experiences of this unique and fascinating museum. 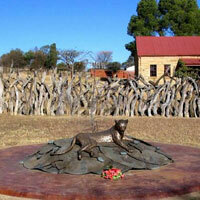 After lunch in the 1912 Miner’s Rest restaurant travel to Elandslaagte- the second battlefield of the Anglo Boer War. Depart Dundee at 8:15 accompanied by an experienced and knowledgeable guide. 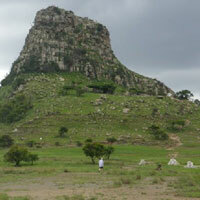 Travel via Malonjeni and the site of the First World War soldier settlement scheme, to Nqutu and then view Isandlwana battlefield from the Nqutu heights. 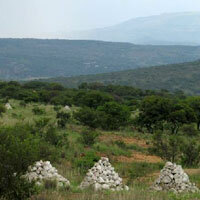 This is the commanding position from where the Zulu commanders controlled the battle. 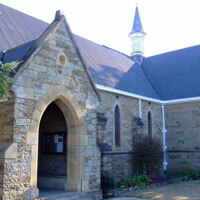 At St Vincents Mission visit the museum and then proceed onto the battlefield. 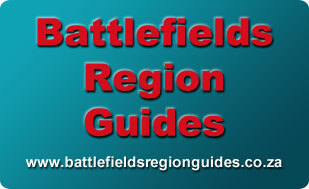 Feel the atmosphere and experience history come alive as you follow your guide across this blood drenched battlefield. 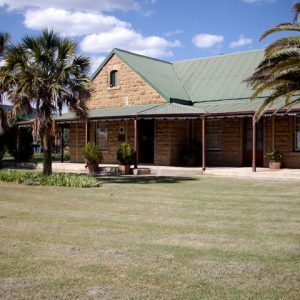 Travel on to Rorke’s Drift, en route hearing the tale of the skirmish at Sihayo’s kraal on 11 January and the story of Henry Harford and his beetle. Crossing the Buffalo river allow your imagination to travel back in time and see the soldiers crossing on the pont where you are in your vehicle. 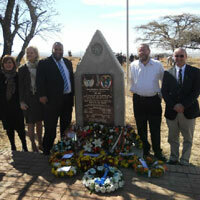 Lunch at Rorke’s Drift cafe. Discuss your options with the guide on booking whether you wish to visit Mangeni Falls or Fugitives Drift (this is only because of time constraints) and your return route. 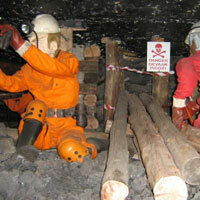 All these sites have amazing stories and atmosphere. 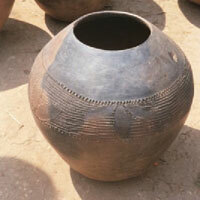 Hear not only the history but the local traditions related to these sites. Return to Dundee by 17:30. This tour takes place on the last Thursday of each month. 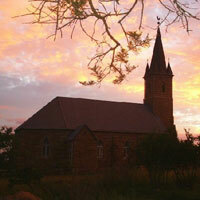 Depart Dundee 8:00 to travel into the heart of Zululand. 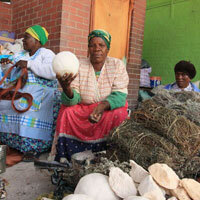 This traditional market, outside Nongoma, is held on the last Thursday of each month. 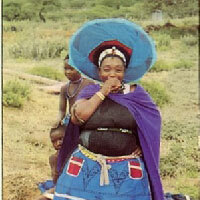 It is a fascinating insight into traditional Zulu culture. Cows, goats and sheep are up for sale, as are herbs and African “muti”, Zulu cultural items, woven grass mats, baskets, ivovu (beer strainers), ikhansi (woven sleeping mats), carved wooden functional items and a whole host of everyday necessities for traditional Zulu people. 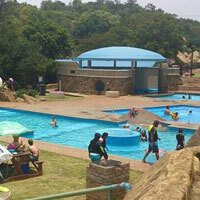 From the market travel to Natal Spa outside Paul Pietersburg for lunch and the opportunity to soak – or swim – in the hot springs. These thermal waters rise up along fault fissures and are heated at the source to between 36 and 45 degrees Celsius. These “triple waters” contain healing chlorides, sulphates and carbonates which is said to help a variety of ailments and even the stresses and strains of everyday life. Depart from Dundee 8:30. On route to Utrecht hear tales of the area. In Utrecht visit the Ou Pastorie museum where the lovely interior of this sandstone parsonage reflects elements of the history of this town. Utrecht was originally an independent republic and then a border town in Natal. 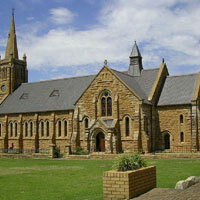 As you visit the superb Dutch reformed Church and the memorial to Capt Powkrowsky (killed on Christmas Day 1900), the memorial to Piet Uys, the Anglican church and the British military cemetery you will be immersed in tales of the Prince Imperial who went visiting a young “Afrikaner meisie” here, Piet Uys who fought for the British forces against the Zulus in 1879 and beautiful old sandstone buildings which reflect a gracious by-gone age. After lunch you will visit Blood River Poort. 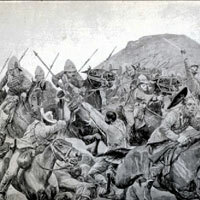 One of the lesser known battles of the Anglo Boer War fought on 17 September 1901, this was an attempt by the Boer forces to invade Natal for a second time. Then take the road less travelled via Kingsley and hear the amazing story of the “Village that never was.” Return to Dundee by 17:00. Depart Dundee 8:30 for Elandskraal. On route stop at lookout over Isibindi Falls. 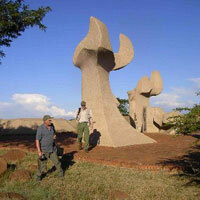 Then travel to the viewpoint overlooking the Elandskraal and Rorke’s Drift valley. Hear the stories of Helpmekaar, just behind you – from both 1879 and 1899 and the San/Bushman people who lived in this area. 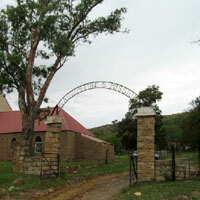 Drive into Helpmekaar village and visit the 1879 cemetery. From here drive along the road towards Elandskraal. 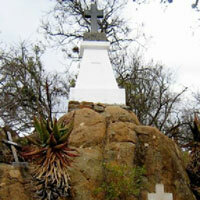 Visit Itshe lamazimu, the cannibal rock, where “people were kept until needed for the cooking pot”. 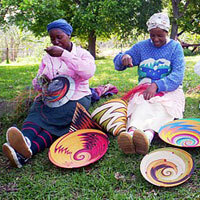 Moving down the pass visit Wezandla handcrafts and see local people making wire work baskets and beadwork. This project is a success story has created beautiful items and created numerous jobs, providing income into an impoverished area. Leaving Wezandla you will hear further tales of cannibals in the area in the early 1800’s. At Elandskraal village, the centre of German missionaries from the mid 19th century, has a superb church, interesting cemetery and a trading store that echoes time past, particularly on month ends with the pension pay outs. Here you will see local people in their traditional dress, watch maize being ground and donkeys emerge from the white cloud laden with sacks of flour. 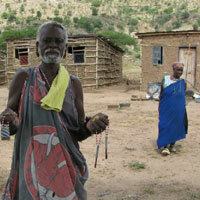 The trading store is an eye opening view into life in rural areas. 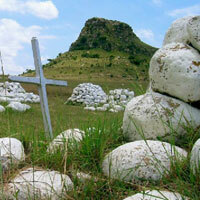 Depart from Dundee at 8:15 for Isandlwana battlefield via Nqutu. Look down on the battlefield as you drive down the Nqutu heights – the same view the Zulu commanders would have had on the day of the battle. 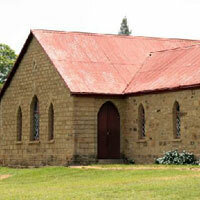 Visit St Vincent’s mission church, view the museum at the interpretation centre and then move on to the battlefield itself. 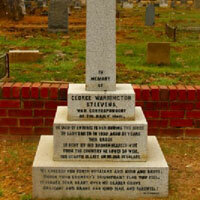 On the site hear the amazing story of this battle fought under an eclipse of the sun. 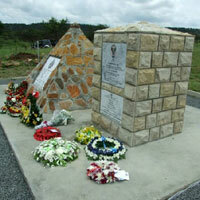 View the many memorials to the Zulu forces, British and colonial troops. From the nek walk in the footsteps of the British soldiers who survived this battle along the route known as the Fugitives Trail. 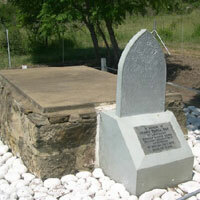 As you walk down to the Manyanzama river, you will stop and hear the story of the men who fought the Last Stand and acknowledge their bravery next to the cairns that mark their final resting place, you will see the site where the British guns were captured, then turn and follow the river to the cairn that marks the spot where 4 men of the Royal Engineers lost their lives. 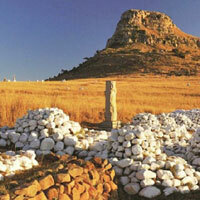 From here you will travel up to the Isandlwana Lodge for lunch – and the magnificent view over the battlefield. 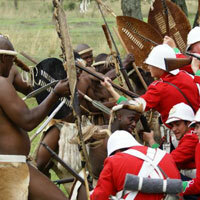 Here you will hear tales of the Zulu commanders and Zulu aspects of the battle. Rorke’s Drift and admire the views as they open up in front of you of Shiyane “the eyebrow” or the Oskarberg, which stands guard at Rorke’s Drift and then Isandlwana proudly against the skyline in the distance. 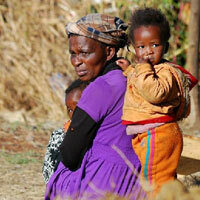 After breakfast, we travel towards the rural areas of Zululand. The scenery is breath taking with spectacular views of deep valleys, high mountains and plateaus. 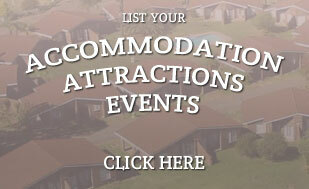 Nature lovers will enjoy the variety of plants, trees and grasses. 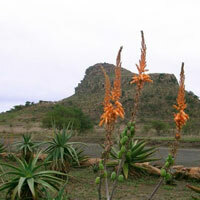 The flowering aloes in winter are also a “must see”. 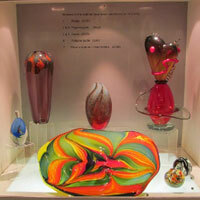 There is plenty for bird lovers too. The area boasts many bird species. 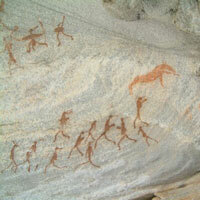 Depending on your interests, we can visit paintings of the Bushmen that once roamed and hunted in the area. 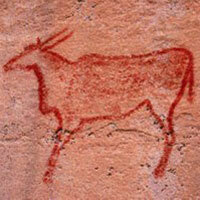 These painting are rarely viewed and few are known about. A visit to a rural homestead is the highlight of the day. THIS IS NOT PRE-ARRANGED – The visit is completely informal, not at all “set up” and you see the Zulu people the way they live everyday in these rural areas. 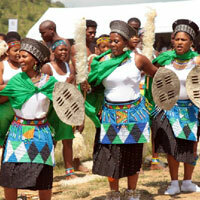 The guide will give detailed explanations of Zulu customs – handshakes, greetings, marriage etc and act as interpreter so that you may ask questions and gain an understanding of traditional rural life and customs. Remember that there are no toilets in the areas, so one must be prepared to use the bush. The rallying cry of British troops at the battle of Elandslaagte 17 years after this battle fought on a mountain top on the border of Natal in February 1881. 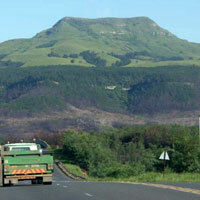 From Dundee depart at 8:15 to Newcastle and beyond to Majuba mountain. At the base of the hill listen to first part of the tale of this battle and then climb the hill. As you progress so your guide will tell you further elements of this battle. On top of the hill, while you catch your breathe and admire the view, your guide will finish the tale of this battle and then walk you around various points of interest on the top of the mountain. Please note that the climb up Majuba along the path is steep and rocky and it will take at least 3 hours to climb up, look around, and climb down. Points of interest on other mountain tops will also be pointed to give you an indication of the lines of communication, supplies etc. 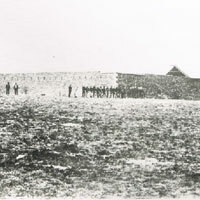 After descending the mountain you will stop briefly at Mount Prospect, the site of the British camp and the cemetery. In the mountain pass we will stop for a brief look at O’Neill’s cottage where the peace treaty was signed to end this war. After a lunch stop in Newcastle visit Fort Amiel, built in 1876 by the 80th Stafford Volunteers. 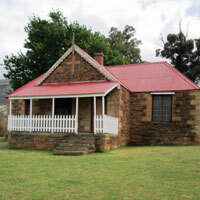 It served as a commissariat depot, transit camp, and hospital during the Anglo-Zulu War and the Transvaal War of Independence. Constructed on a knoll overlooking the original wagon drift across the Ncandu River it had a good view over the town of Newcastle. Sold in 1882 it fell into disuse. 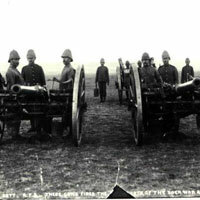 During the Anglo-Boer War it was occupied by the British who again used it as a transit camp, military hospital and commissariat. 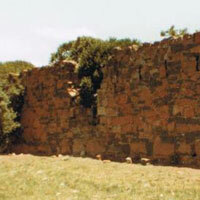 In 1979 the site was declared a National Monument, restoration begun and the museum installed. Return to Dundee by 17:00. Note that Fort Amiel museum is closed on Saturday afternoons and Sundays. Depart from Dundee at 8:00. 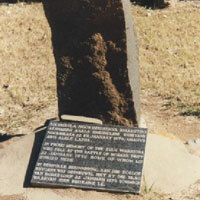 Visit Ladysmith, under siege for 118 days and described by Churchill as “famous to the uttermost ends of the earth: centre of the world’s attention, scene of famous deeds, the cause of mighty efforts”. 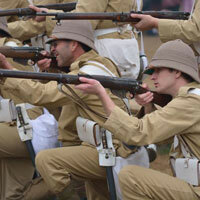 In the fascinating Siege Museum you will be able to get an insight into what it was like living in Ladysmith, of the weapons and tactics used by both sides and of the battles fought. 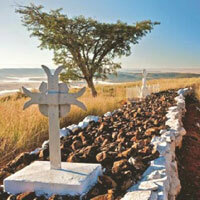 Then travel on to Spioenkop battlefield, one of the most famous and bloody of the battles. Spioenkop, “the acre of massacre”, occupied by the British in the early hours of the 24th January 1900 and fought over desperately by Boer and British for all that day until nightfall. The British withdrawal left over 330 of their men dead and many more wounded in their trenches. 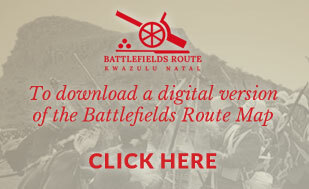 Listen to the heartrending tales of confusion, bravery, missed opportunities, introduction of new battle tactics as you move around the battle site, inspect the monuments to Boer and British, and stand in silence at the long mass grave of the British. 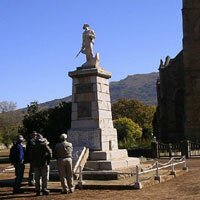 Time permitting we may make a quick visit to the Platrand overlooking Ladysmith. 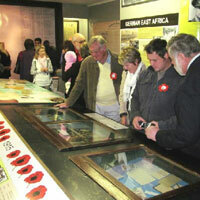 Note the Ladysmith Siege Museum is closed on Saturday afternoons and Sundays and so cannot be included in the tour. Longer time will be spent on Platrand and include a number of different sites with the tale of the desperate battle fought in a raging thunder storm in January 1900. Return to Dundee by 17:30. As you drive along the modern road through the Tugela Heights and on to the site where the Armoured Train was ambushed and young Winston Churchill was captured, consider the British troops climbing and marching through these hills in the height of summer 1899 and 1900. 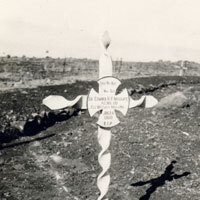 Return back along the road to the military cemetery at Chieveley where young “Freddy” Roberts is buried and then visit the cemetery at Clouston before visiting the “Gun Site” at Colenso. 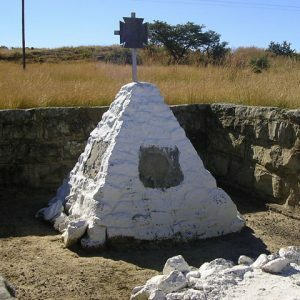 From here you return to Ladysmith for lunch before visiting Platrand, a long ridge overlooking Ladysmith made up of two features, Caeser’s Camp on the east and Wagon Hill and Wagon Point on the west. These positions were the scene of a determined Boer attack in the early hours of 6th January 1900 and equally determined British defence. The battle eventually ended in a tremendous rainstorm in the late afternoon which enabled the British to finally gain control with the famous “Charge of the Devons”. You will have the chance to visit the numerous monuments to the men of both sides, inspect the remains of the British defences, Fort Manchester, the position of 42nd Battery’s guns and the gun emplacement for the “Lady Ann” on Wagon Point. This latter position is often overgrown and the access path is rough, making it difficult to reach. 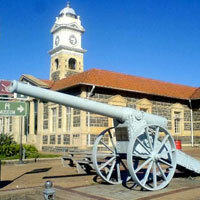 Note the Ladysmith Siege Museum is closed on Saturday afternoon and Sunday. Return to Dundee by 17:30. This tour may be done as either a full or half day. Naturally in a half day you will see fewer sites. 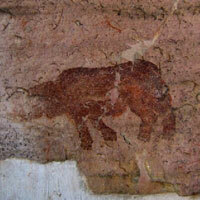 Visit rock art sites in the Dundee/Rorke’s Drift area. 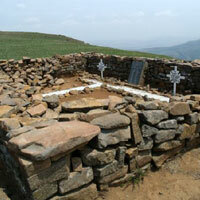 These sites are considerably older than sites in the Drakensberg. 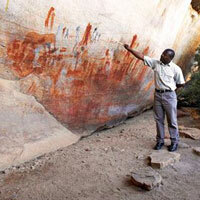 Your guide will explain the symbolism of rock art, the daily life and culture of the San/Bushman in this area.